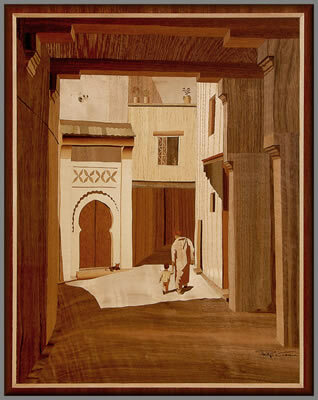 Marquetry in different forms has long existed in the Arab world. 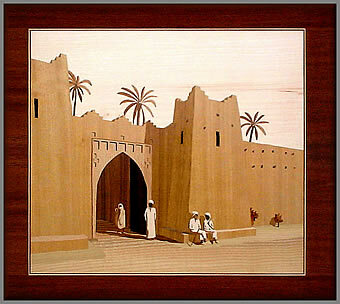 Artistic creativity has been channelled into geometric designs because of Islam's prohibition of human and animal imagery, although not all artists follow this interpretation. 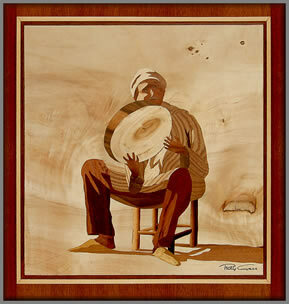 In Essaouira, skilled craftmen create beautiful tables by carving into the locally grown Thuya wood (the tree and its roots produce rich swirling burr wood) and inserting lemon and other local woods into the holes. 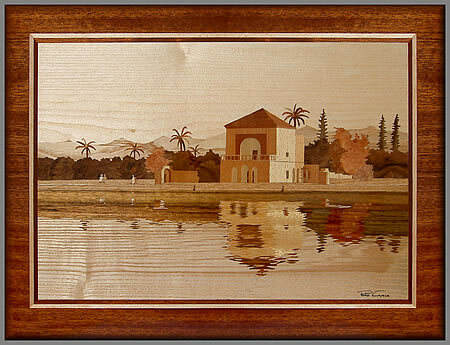 Morocco provides many ingredients for a marquetry artist to work with. 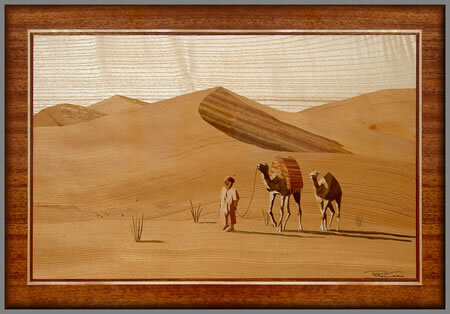 The scenery is often sparse, so that the veneer can do its work without too much detail. 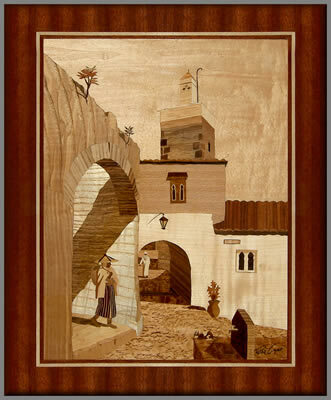 The narrow streets in the old medinas are an inexhaustable source of colourful settings and always frame people nicely. The place, however, is nothing without the characters who inhabit the pictures and bring the scene to life. Morocco is full of such characters. 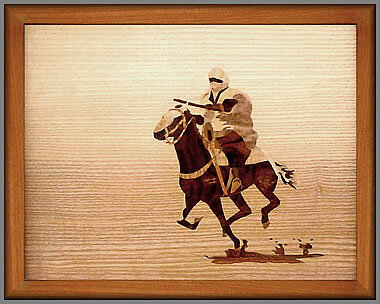 People still wear traditional clothing in many areas, so that pictures can capture a quiet timelessness - it could be today or 100 years ago. 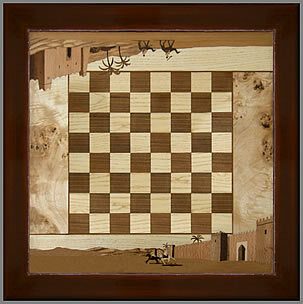 Colours of scenery, houses and clothing all lend themselves perfectly to the beautiful tones of natural wood. And, of course, Morocco has a lot of sunshine. The bright evening sun produces strong contrast and dark shadows. 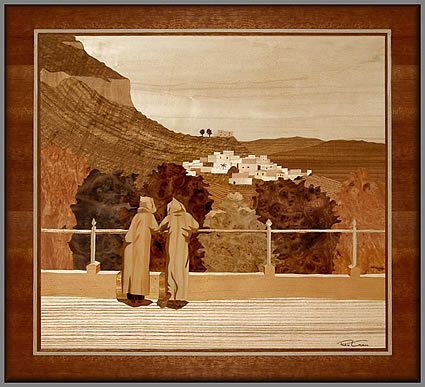 These not only make it easy for the marquetarian to decide where to make the cut, they also bring a picture to life and create a sense of calm. Philip Grace is British, but has been living and teaching English in Morocco for over 10 years. 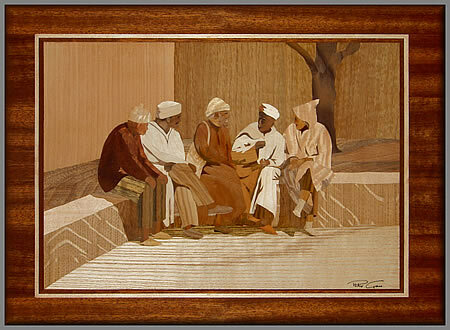 He has taught several Moroccans the techniques of pictorial marquetry.